French name: Lathrée clandestine, La Clandestine. 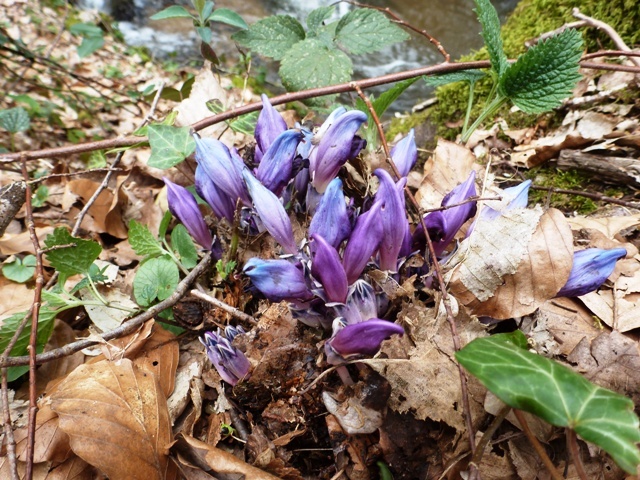 Whilst out walking at the weekend here in La Corrèze, I was thrilled to find several clumps of Purple Toothwort in a small wood, close to a stream. Lathraea clandestina is a perennial root parasitic plant which usually uses willows, poplars and alders as its host though it has also been found on a number of other trees and shrubs including maples, yew and rhododendrons. Being parasitic Lathraea clandestina relies on food produced by other plants to survive. In spring a clump of gorgeous purple, hooded flowers appear just above the soil, often at quite a distance from its actual host. 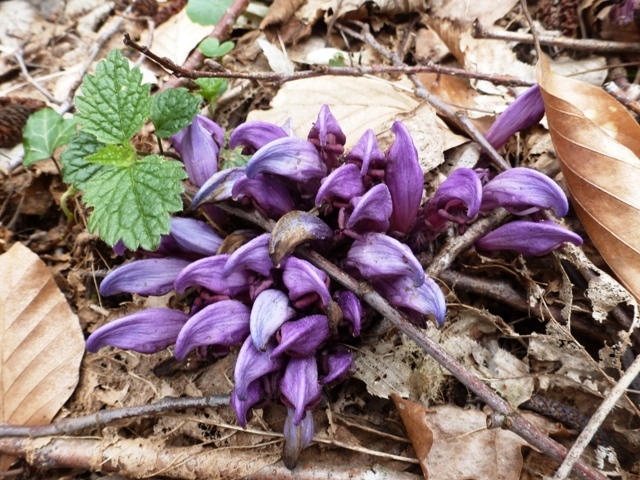 As Purple Toothwort completely lacks chlorophyll the plant does not have any leaves and vanishes from view as soon as it has dispersed its seeds. In recent years it has become a popular addition to woodland gardens and I can see why as I thought it was beautiful. It is found in the wild in Central and Western France. Keep an eye out for it now as it won’t be around for many weeks and I’d love to know if you have come across any, so please leave your comments in the box below. I remember large drifts of Lathraea at Alan Mason’s manoire at Porte de Roche about 25 years ago. (At that time Alan, a former student of mine made a series of TV programmes about french gardens) It was this time of the year when I was there and the plant made a magnificent carpet under the willows and poplars-happy memories! We found this plant today near our home just over the border in Creuse, and we have you to thank for solving the mystery for us of what it is! A truly amazing looking plant. We looked with interest at your garden plans as we’re doing similar things here. That’s wonderful, I’m so glad that my blog helped out. Good luck with your garden plans, I’m sure like us you’ve got plenty of work on your hands! This seems to be around here in the Deux Sèvrres quite a lot. It has taken me a while to identify, so thank you! I always wondered what this beautiful plant was. We have lots in our woodland garden in the Vendee. I adore the colour. Thanks for the info. Have found these in our garden in Creuse (near La Celle Dunoise) and have been trying to identify them. these flowers grow also in my garden! I was aware of them for years but recently someone told me its name and I’m quite proud of it! It grows close to a small river central Belgium (Brabant Wallon) and the soil is often quite dampy. I saw this for the first time at Wisley last week and since then I’ve been looking for seeds. Can’t find a supplier anywhere! We’ve got some great mature willows next to the stream in a woodland area of our garden so I think we’d be in with a chance of a successful cultivation, even if it took a few years to flower! Have you any idea where I might source seeds to get the ball rolling? I’m going to France in July so I’ll see if I can find any seeds. Long shot but if I do I’ll get some for you. thanks for helping me identify this. I found a clump at the base of an old willow I’ve pollarded in our garden in Lot et Garonne about a fortnight ago. We live in Deux Sevres, France, and have a lot of these in our fields, ad you say under the trees. They are such a beautiful colour. We didn’t know what they were, someone kindly gave us your website. I found lots of these alongside a stream at St Beauzeil (82150) this week. Superb plants. While walking near home in the Gers last Friday I came across patches of this plant on a river bank. Thanks to a friend in the Netherlands who has been able to identify it I now know where to find Lathrea clandestina. An amazing plant! I have a small piece of land in Deux Sevres France that has a lake, a stream, an orchard and willows and plaine trees and around this time of year the Purple Toothwort makes a fantastic appearance making a wonderful show. We have these beautiful flowers in our garden in the Indre (36) region of France. I photographed some of them just last week. I’ve just had notification from Avon Bulbs that they have Purple Toothwort bulbs in stock, so if anyone on the forum is interested they should follow the link below. Only place I’ve found them! I came over here from #AllAboutFrance — you have a gorgeous blog. Unfortunately, I am no garderner but it makes me want to be one! I live in Aveyron and am very fond of Corrèze — we have some good friends who live between Collonges and Turenne and have enjoyed many short stays there. HI, they are beautiful. I’ve never seen them but I shall start keeping an eye out. My first early purple orchid for the season is in flower! I too found this via #allaboutfrance linky. As you’ll see from my blog, I know very little about gardening or identifying flowers but hope to do so and your blog will definitely help – in fact the photo underneath of the red dead-nettle has already allowed me to identify that. Many thanks. I will return! I’m so pleased to have found this page! I was Googling to try to identify this strange flower. We saw clumps of it on the banks of the Canal du Midi at Seuil de Narouze today, then found more at Serres sur Arget in the Ariège. Thank you for solving my problem. It’s a beautiful plant.